A travel to Delhi will cast an irresistible spell of charm to the tourist. Both 'Old' and New Delhi exert a beguiling charm on visitors. Explore Old City and get immersed in the Mughal past. Stroll down the labyrinthine streets of Old Delhi before coming out in the lush boulevards of imperial New Delhi, with its planned governmental offices and tree-lined avenues. Delhi is the capital city of India. Delhi is India in miniature. Delhi is 32,87,263 sq km of India's fantastic variety compressed into 1483 sq km. Over the millennia, it has wooed rulers, attracted plunderers, and tried historians with so many details. Today, even as it preserves an enviable heritage, Delhi is a true cosmopolitan city always on the move. Delhi, the capital of India houses some of the magnificent monuments built from 12th century monuments built from 12th century onward - The Red Fort, Qutab Minar, Humayun's Tomb, Jama Masjid, India Gate (War Memorial), Parliament House, Presidents's House, Bahai Temple (The Lotus Temple) are worth a visit. Besides, there are number of interesting museums. The most important ones are National Museum - the premier museum of India, National Gallery of Modern Art, Rail Museum and Gandhi Museum. Shopping in Delhi is an unforgettable experience. It's Journey into history, tradition, art and culture, a trip to treasure house which mirrors the very best of India's Craftsmen. What makes shopping in Delhi even more unique, is that the visitor has the options of walking into modern air conditioned stores through narrow alleys to traditional shops where often, the artesian himself is present to explain the intricacies of his craft. The main shopping areas are Cannaught Place where you have major emporiums from all the states. To buy cheap and fancy products, you have choices like Janpath, Sarojini Nagar, Palika Bazaar. South Ex is one of the famous but quite expensive as it houses all the branded products. Delhi has seen many invaders through the ages. Tamerlane plundered it in the 14th century; the Afghan Babur occupied it in the 16th century and in 1739 the Persian Emperor, Nadir Shah, sacked the city and carted the Kohinoor Diamond and the famous Peacock throne off to Iran. The British captured Delhi in 1803 but during the Indian Mutiny of 1857 it was a centre of resistance against the British. Prior to partition, Delhi had a very large Muslim population and Urdu was the main language. Now Hindu Punjabis have replaced many of the Muslims, and Hindu predominates. Bounded by the state of Uttar Pradesh and on three sides by the state of Haryana, Delhi is located at the western end of the Gangetic Plain. The best time to visit any place is when the climate and temperate is moderate. As for Delhi, the temperature is at extreme for about half of the year. So the ideal time to visit Delhi is during the seasons of February to April and August to November. During this time the nights are slightly cool and days are filled with mellow sunshine. The months of May, June and July are very hot with the temperature over 45 ?C. The monsoon season is from July to September. The bloom season of February and March makes Delhi colourful and bright. This is the time when Delhi is in full blossom. Everywhere there is greenery and blooming flowers. This pleasant climate makes this time ideal for the tourists to come and enjoy the galore beauty of the city. Air: Delhi is a major International Gateway to India. It has an extensive network of International as well as domestic flights. All the major airlines in the world fly through Delhi, and it is easily accessible from anywhere in the world. Domestic air links cover Delhi from all the major cities in the country. Train: Delhi is an important rail center connected to all places in India. It is an excellent place for booking too. There are two main stations in Delhi, Delhi Station and new Delhi station at Old Delhi and Paharganj respectively. There also the Nizamuddin station in South Delhi. Trains run from all the parts of the country to Delhi. For nearby places like Chandigarh, Dehradun, Gwalior, Bhopal, Lucknow and Kanpur, the Shatabdi Express is recommended. Bus: Buses from all major places in Uttar Pradesh, Punjab, Haryana, Himachal Pradesh, Madhya Pradesh and Rajasthan are available for getting to Delhi. During the summer months, air-conditioned coaches are recommended. India Gate, Delhi: the 42 metre high, free standing arch, popularly known as India Gate, was designed by Luytens and built in 19111. It was originally called All India War Memorial in memory of the 90,000 Soldiers of the Indian Army who died in World War I. The names of the soldiers are inscribed all along the walls of the arch. In1971, an eternal flame was lit here to honour the Amar Jawan (immortal soldiers). Purana Qila (Old Fort), Delhi : the ruins of the fort are located on a small hill which once stood on the banks of the river Yamuna. Legend has it that the fort marked the site of Indraprastha,, the magnificent capital of the Pandavas, though the construction was carried out by Sher Shah Suri sometime between 1538 to 1545 AD. The structure houses a mosque which has a double storeyed octagonal tower. It is said that the Mughal king Humayun fell from the tower and died. At the foot of the hill is a lake where the Delhi Tourism has arrangements for boating. Jantar Mantar, Delhi : Within Connaught Place is the Jantar Mantar Observatory built by the Rajput King of Jaipur Sawai Jai Singh in 1724. It was believed to have been built with masonry instruments for observing the movements of the stars and planets. Humayun's Tomb, Delhi : Taj Mahal is known have been inspired by Humayun's Tomb, and in many ways this magnificent red and while building is as spectacular as the famous Taj Mahal in Agra. Tomb is memorial by a grieving wife and was built by his widow Haji Begum in 1565-66, nine years after his death. The splendor of this grand monument becomes overpowering on entering through the lofty double storeyed gateway. It is set in the centre of a large square garden enclosed by high walls on three sides, while the river would have been the forth boundary. The Chahar Bagh is divided into smaller squares by pathways as in a typical Mughal garden. The fountains were worked with simple yet highly developed engineering skills quite common in India during that period. Chandni Chowk, Delhi : It was the eyes and ears of the Mughal's commercial instincts and is today one of the country's best known wholesale markets for textiles, electronic goods and many other items. The entire area was designed by Jahanara Begum, Shah Jahan'' favorite daughter and was then inhabited by the well-to-do families of the time. In today's time, this area is highly congested. Safdarjang's Tomb : It is the last enclosed garden tomb in Delhi in the tradition of Humayun's Tomb though it is far less grand in scale. It was built in 1753-54 as the mausoleum of Safdarjang, the viceroy of the Awadh under the Mughal Emperor, Mohammed Shah. It has several smaller pavilions. Parliament House, New Delhi : A marvelous piece of architecture which can be admired only from outside on account of security restrictions. Close to President's House, it is circular structure almost a kilometer in circumference, and was designed by the famed architect Luytens. It is the seat of Indian Parliament. Rashtrapati Bhawan (President's House) : The official residence of the President of the country, the building was also designed by Luytens. It was the official residence of the Viceroy when the British ruled India. With 340 rooms and an area of about 330 acres. The Mughal Gardens within the complex are a treat for the eyes and are open to public during certain periods of the year. Birla Mandir (Laxmi Narayan Temple), New Delhi : It was built by the industrialist Raja Baldev Birla in 1938. The temple is an important prayer centre and contains idols of several deities. Interestingly, Mahatma Gandhi, who inaugurated the temple, was also a regular visitor to it. Akshardham Temple : Representing the Hindu mythology and the Indian culture, the Akshardham Temple stands on the banks of river Yamuna, covering an area of 100 acres. This modern-day wonder boasts 234 embellished pillars, 20,000 statues and a number of arches. The temple complex houses an IMAX theatre, exhibition halls and musical fountains. Surrounded by beautifully laid out garden, the temple attracts lakhs of tourists from far and wide. The temple is built in marble and red sandstone, symbolising devotion and eternal peace. 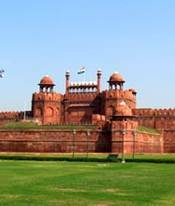 Red Fort : Built by the Mughal emperor Shah Jahan between 1638 and 1648, the masterpiece of Red Fort has the distinction of being chosen as a site from where the prime minister of India addresses the nation on the Independence Day. Popular as Lal Quila, the grand and imposing fort is today a regular haunt of tourists from all parts of the world. The unparalleled architecture is testimony to the grandness of supremacy of Mughal empire in India. The complex houses Diwan-i-Am, Diwan-i-Khas, the Moti Masjid, the Shahi Burj etc. The fort stands as dignified and grandiose as it did centuries ago. JAMA MASJID, DELHI : The country's largest mosque where thousands of Muslims offer prayers every day. It took over 14 to complete and was built in 1656. It lies opposed the Red Fort. The flight of stairs and its large courtyard are marvels of architecture. It has three gateways, four angle towers and two minarets standing 40 metres high and constructed of alternating vertical strips of red sandstone and white marble. Broad flights of steps lead up to the imposing gateways. The eastern gateway was originally only opened for the emperor, and is now only open on Fridays and Muslim festival days. QUTUB MINAR, DELHI : This magnificent structure in the southern part of the capital was built by the Muslim King, Kutab-ud-din Aibak in 1199 AD. A part of it which could not be finished by completed by another Muslim King, Iltutmish. In 1368, Feroz Shah Tughlaq rebuilt the top storeys and added a cupola. An earthquake brought the cupola down in 1803 and an Englishman replaced it with another in 1829 but was removed some years later. Minar(tower)is 72.5 metres high and tapers from 15 meter-diameter base to just 2.5 meter at the top. The tower has given distinct stories, each marked by a projecting balcony. The first three stories are made of red sandstone, the fourth and fifth of marble and sandstone. At the foot of the Qutab Minar stands the first mosque to be built in India, the Might of Islam Mosque. Qutab-ud-din began construction of the mosque in 1193, but it has number of additions and extensions during the years. Iron Pillar : This seven meter high pillar stands in the courtyard of the mosque and has been there since long before the mosque. A six line Sanskrit inscription indicates that it was initially erected outside a Vishnu temple, possibly in Bihar and was raised in memory of the Gupta King Chandragupta Vikramaditya, who ruled from 375 to 413. The pillar is made of a very exceptional pure iron. Scientists have never discovered how this iron has not rusted even after 2000 years. TUGHLAQUABAD FORT, DELHI : The massively strong walls of Tughlaqabad, the third city of ancient Delhi, is situated in east of Qutab Minar. The walled city and fort with 13 gateways was built by Ghiyas-ud-din Tughlaq. The storey behind the construction of this massive fort is that the king took away workers who were engaged in constructing a shrine of Sufi Saint Nizam-ud-din. As a result the Sufi Saint cursed the King that his city will not be inhabited for long and only Gujars (shepherds) will shelter here. Truly, today is the situation. NIZAMUDDIN, DELHI : Across the road from Humayun's Tomb is the shrine of the Muslim Sufi saint, Nizamud-din Chishti, who died in 1325 at 92. His shrine, with its large tank, is one of the several interesting tombs here. Other tomb in this area include the later grate of Jahanara, the daughter of Shah Jahan, who stayed with her father during his imprisonment by Aurangzeb in Agra's Red Fort, Amir Kusru, a renowned Urdu poet. On Thursday around sunset time, the qawwali singers start performing after the evening prayers. LODI GARDENS, DELHI : About three km to the west of Humayun's Tomb are the well kept gardens and in the gardens are the tombs of the Sayyid and Lodi rulers. Mohammed Shah's Tomb(1450) was a prototype for the later Mughal style tomb of Humayun's, a design which would eventually develop into the Taj Mahal. The other tomb include those of Mubarak Shah(1433), Ibrahim Lodi(1526) and Sikander Lodi (1517). HAUS KHAS : Situated midway between Safdarjang and the Qutab Minar, this area was once the reservoir for the second city of Delhi. Siri, which lies slightly to the east. Interesting sights here include Feroz Shah's Tomb (1398) and the remains of an ancient college. BAHAI TEMPLE : Lying to the east of Siri is this building shaped like a lotus flower. Built between 1980 and 1986, it is set amongst pools and gardens, and adherents of any faith are free to visit the temple and pray or meditate, according to own religion and faith.